Save big on gift wrap and use items you already have in your home. 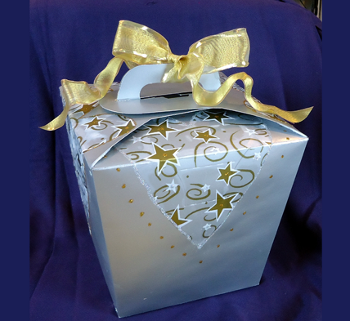 To create a Simple Recycled Gift Box, add spray paint, glitter and other embellishments to an old bagel box. When it comes to fun gift ideas, crafts are a surefire way to stand out from the crowd. Spray the box with paint, inside and out. Allow to dry and spray on a second coat. Allow to dry. Trace the sides of the box to make pattern for the felt that will be glued to the inside of the box up to the fold. Spread Tacky Glue on one inside side at a time and lay the felt into the glue. Press and smooth for firm attachment. Repeat for all sides. Optional: Cut decorative felt pieces that will be glued above the fold on the flaps. Use No Sew Glue around the edges. Cut plastic or fabric hearts to cover the perforated parts on the outside of the flaps. Glue in place. Allow to dry. Add decorative details with glitter glue. Allow to dry. Cut a 3′ piece of wired ribbon to tie the handles together and make a pretty bow.